You should visit a qualified exotics veterinarian at least once a year for check-ups on your rabbit’s diet, behavior, and health. Be prepared for your pet’s visits by making a list of any questions or concerns you may have ahead of time. Ask your veterinarian to recommend an appropriate age to have your rabbit spayed or neutered; this will increase the chances of a longer, healthier life for your pet. Many rabbit health problems are preventable with proper diet and care. Rabbits don’t usually like to be picked up or carried. The best way to interact with your rabbit is to get down to his level and play with him on the floor. 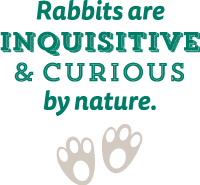 Be sure you are always with your rabbit when he is out for playtime; rabbits are curious by nature and could get into trouble if left alone. Some rabbit behaviors can seem rather strange. For example, you may see your rabbit eat its own poop. This is a normal, healthy behavior that provides essential vitamins and nutrients.